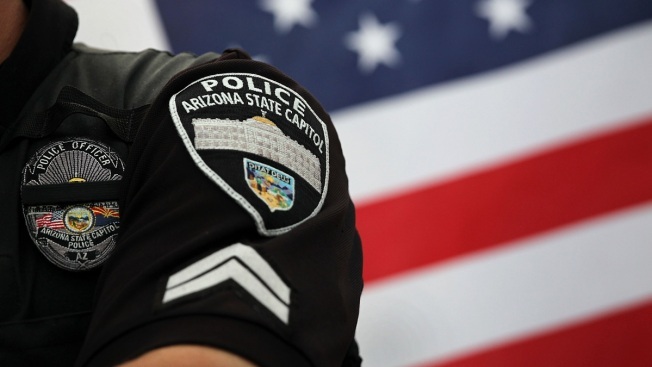 In this July 31, 2010, file photo, a policeman stands guard in Phoenix, Arizona. Police with guns drawn broke down the door of an Arizona home and ordered three children into the custody of the Department of Child Safety because the parents had refused to take their son who has a fever to the hospital. Sarah Beck brought her 2-year-old son to Southwest College of Naturopathic Medicine and was told he had a temperature of more than 105, according to reports by the Chandler Police Department. The doctor believed the child could be suffering from a "life-threatening" illness that could not be tested for at the clinic, so she told Beck to take the toddler to the hospital, a police report said. The mother was reluctant because the boy wasn't vaccinated and she feared "possible repercussions," the report said. When the doctor found out the child had never made it to the hospital, she called the DCS who contacted the Chandler Police Department because "there was a present danger to (the child’s) health/wellbeing and that he required immediate medical attention," police said. When police arrived, Beck and her husband, Brooks Bryce, wouldn't let them into the house. "While on scene, DCS obtained a court order for the temporary custody of the two-year-old child," said a statement from police. "The parents continued to ignore all attempts from DCS and officers to speak with them on the telephone or at the front door." After one final warning, police broke down the front door. "They said ‘Brooks, you have to come out of your house right now … We have to check on them,’ and I said, 'he’s doing fine, his temperature is 100 degrees. He's safe, he’s asleep, could you please just leave us alone,’” Bryce told NBC affiliate KPNX.